There are many kinds of endings in our daily lives, with some more significant than others. Of the different milestones in life, dating, career, marriage, kids, divorces, and deaths, death is starting to rear its ugly head more often. Another friend of mine recently lost his father, which puts life in the forefront of my mind. 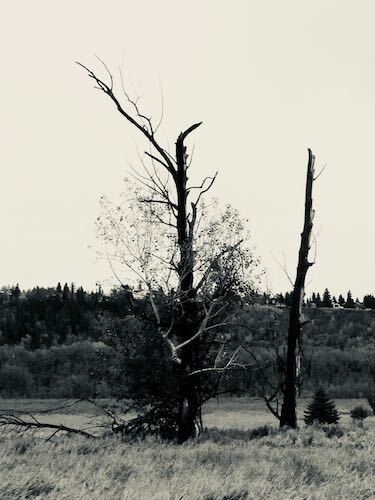 Walking in the river valley today, I looked at this tree with different eyes. It immediately struck me as an embrace. The last living limb wrapping around the dying trunk. Hug your people. Life is short, even when it isn’t. This entry was posted in Photography, September 2018 on September 18, 2018 by Deann.